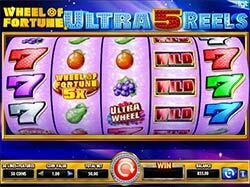 Wheel of Fortune Ultra 5 Reels - Play Online at Slotorama! Everyone's favorite game show is back on the reels with the incredible Wheel of Fortune Ultra 5 Reels slot machine from IGT, available for free play at Slotorama! Everyone’s favorite game show is back on the reels with the incredible Wheel of Fortune Ultra 5 Reels slot machine from IGT! This 5-reel, 3-row and 30-payline video slot game takes to the game set in Las Vegas where you’ll be spinning the wheel to try to hit your riches! First off, the big band Vegas music that plays when you spin the reels really gets the body moving. Couple this with the glitzy graphics that include a jewel studded title and jeweled symbols and you know that you’re in a game that could award some hefty prizes. On the reel you’ll find classic symbols like a pear, an orange, cherries, grapes all adorned in rich gems. You’ll also find other symbols including 5 different colored 7’s, a wild and three different feature icons, as well as multiplier symbols that hit from time to time during different rounds to offer decent sized prizes. Wheel of Fortune 5x Wilds – Hitting the WoF 5x wilds symbols multiplies all wins by 5x when this symbol is included. It will substitute for all symbols except the three feature symbols to complete winning combinations when possible. Wild Multiplier Symbol – The Wild in big red letters, when part of a line win, the wild transforms into one of either a 2x, 3x, 4x or 5x symbol. These multiply the line win by the amount shown on the symbol and substitute for all symbols except the three feature symbols. Getting more than 1 wild multiplier may substitute and multiply any line win by up to 25x! Ultra Wheel Bonus – Land three Ultra Wheel symbols in any position on reels 2, 3 and 4 to trigger the Ultra Wheel Bonus. Here you’ll spin the bonus reels to determine the active wheels in the ultra wheel bonus. Each reel determines if one wheel is inactive, active, or has a multiplier value in addition to being active. Scatter Wheels Bonus – Land three or more in any position of the Scatter Wheels symbols and trigger the scatter wheels feature. Each triggering symbol transforms into a wheel and spins automatically.